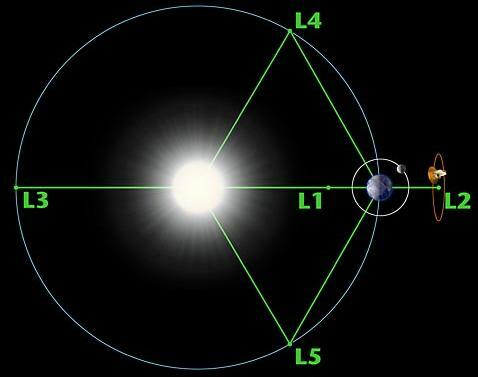 The Lagrange points of the Earth-Sun system (L1 and L2 and the orbit of the Moon, and of course the size of the actual objects (the Sun, Earth, Moon and spacecraft) are not to scale) (image from the WMAP-2 site). Objects located near the Lagrange points experience a net gravitational force, due to the combined effect of the Earth and Sun, that tends to keep them near those points for a fairly long period of time. L4 and L5 are essentially stable positions. Objects near these points can "orbit" the points, moving around the Sun with the Earth, maintaining a relatively constant position relative to the Earth and Sun, essentially forever. Other than thin clouds of dust-sized particles, nothing is known to be orbiting at the Earth's L4/L5 points, but numerous asteroids occupy the corresponding points 60 degrees ahead of and behind Jupiter. These are called the Trojan asteroids, because they are named after characters from the Trojan War. Some of the moons of Saturn have other moons orbiting at their L4 or L5 points, which are sometimes referred to as the Trojan moons of one satellite or another, because of the similarity of their orbits to the Trojan asteroids. Objects near L3 (such as the fictitious anti-Earths of numerous appallingly bad movies) drift away from that point over periods of a century or so, while objects near L1 and L2 drift away from those points over periods of only three weeks, but can be made to orbit them for much longer periods of time using relatively small adjustment forces. The SOHO spacecraft, which makes extreme UV observations of the Sun, has a "halo" orbit around the L1 point about a million miles "in front of" the Earth (four times further away than the Moon), so that the Sun is always visible. The WMAP-2 spacecraft, which maps the cosmic microwave background, has a halo orbit around the L2 point about a million miles "in back of" the Earth, so that by pointing away from the Earth it can make observations that are always unaffected by the glare of the Sun, Earth and Moon.